EDIT... now the template is complete. Here is the demo video finished Oct. 1, 2016. Send me your email address for your free copy. Video: FH-1 driving CV lighting and modular synth. One continuous improve. Again, another demo video has evolved further than I expected, so if you dig it show it around, even just for any occasional musical grooviness. Lot's of fun diving deeply into the FH-1. Again, thank you, OS, for the incredible instruments. Thanks all for support and ideas and watching. Here is the first page of an editor/controller I'm making in TouchOSC for the FH-1. I'm running it on an iPad 3. 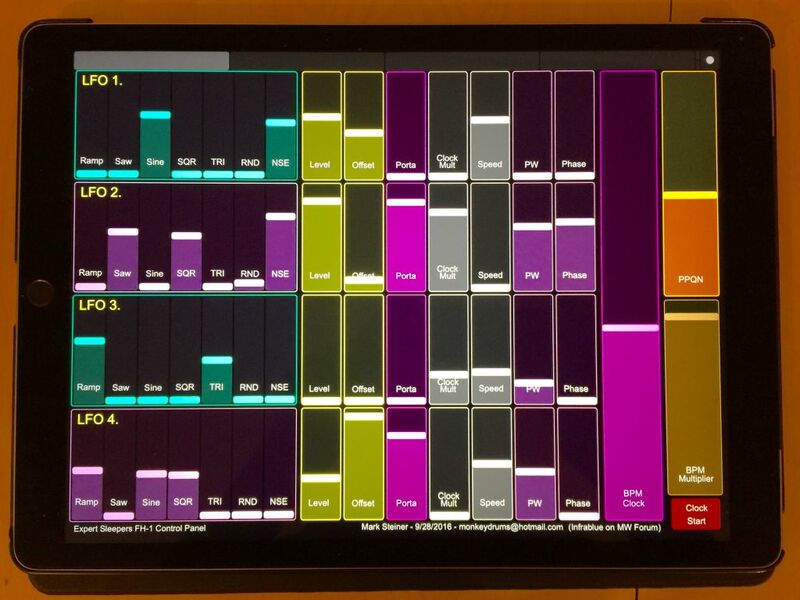 This is 1 of 2 pages that will control the LFO's (this is for LFO 1-4). Any thing I am missing relevent to LFO so far? 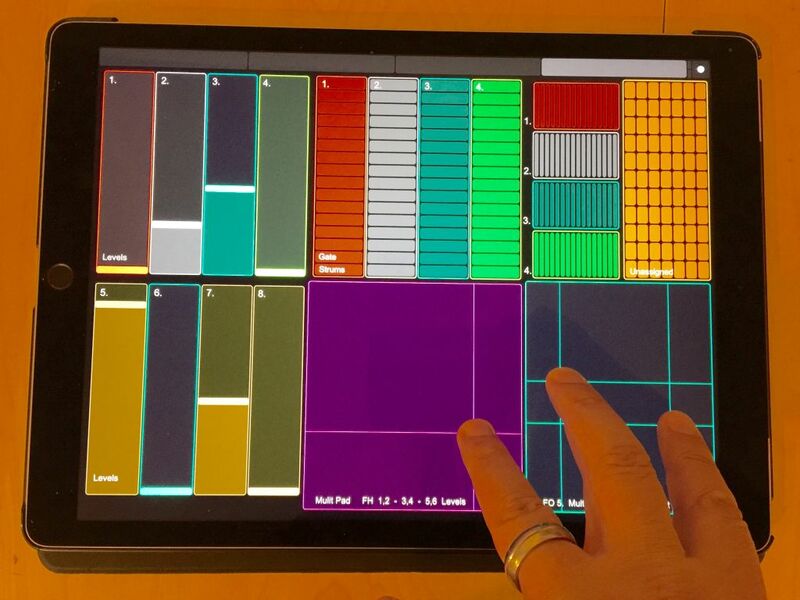 I'm also going to make a few pages for the 2 sequencers, and another page or more of mixed functions, or simplified controls strategically grouped. 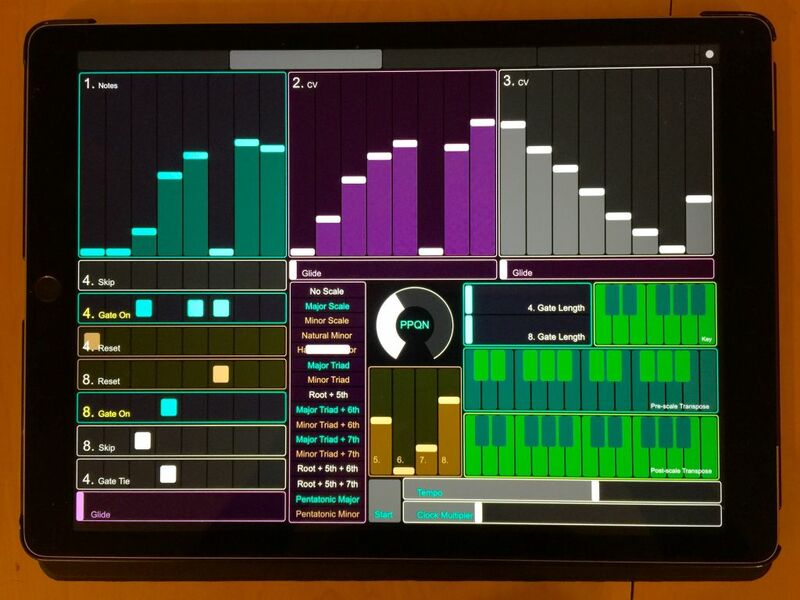 I also want to make a "strum bar" at the bottom of some pages to manually, rapidly use output 8 to send input triggers to input X. I got a similar control working quite effectively on a TouchOSC editor I made for the Jomox Mbrane11. The strum bar is just a whole bunch of tall, skinny buttons that send a midi note on. For this though, I think I'll have to somehow set the buttons to send a trigger (or just a high CV level) out of output 8 and zero it back down when released... or just alternate the buttons with high and low logic (CV levels). When it's done it free to use for any who would like it emailed out. I'll post video and more images as it progresses. right back at you for creating the amazing FH-1! OS... I've only had an FH-1 recently and I got it used. It has a script on it that put all LFO's on one midi channel. I do want to update it to the most recent, and do want my editor/controller to be mapped to your default CC's and channels, so that it'll be useful to others. If I simply update the firmware, that will virtually restore to defaults etc., correct? Updating the firmware won't restore defaults. Ha! You're making miss the one I sold you! lol I was wondering if you'd see this. Much appreciated acquisition! Nice job. I'm interested in trying it out. 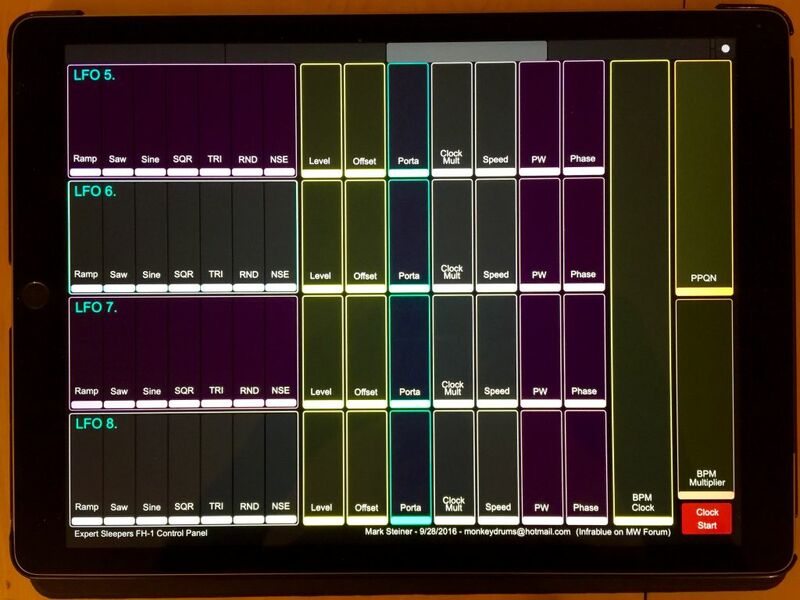 I use TouchOSC on a android tablet but its connected to my computer via Wifi, How do you connect the Ipad to the FH-1? iPad through wifi with a Mac on that wifi, then usb from the Mac works. But a bit of a delay. As shown in other Expert Sleepers sections you can couple two standard usb to midi cable-devices (through a camera kit on the iPad end) and go directly in. Which is nice and fast. Question: when you do the CC value in the correct place of..... "64 - skip. The step is skipped." ... does this actually mean the step is skipped in time? Or just silent in the sequence? If I give a step that skip command, would I then turn an 8 step sequencer into a 7 step sequencer? Great... thank you! Such a valuable feature for me. 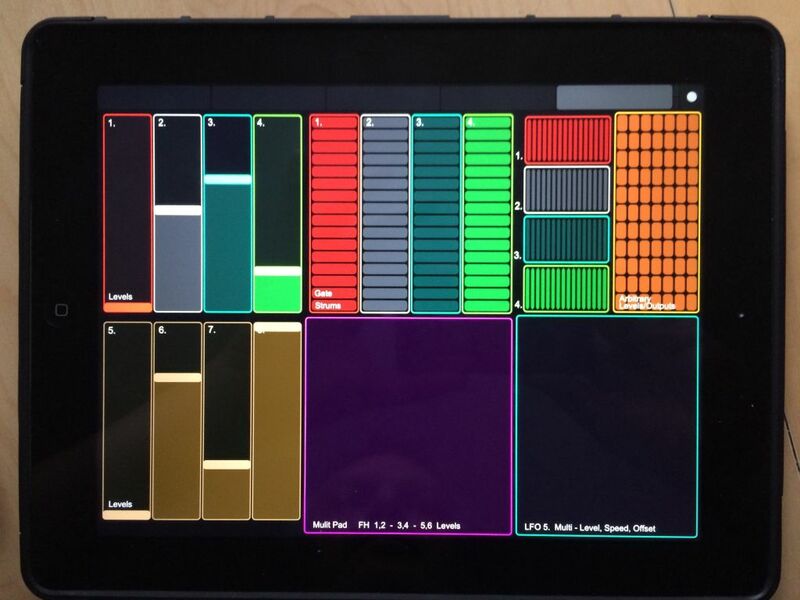 Today I put together the Sequencer page for TouchOSC/FH-1. It also has a few controls for LFO and unused faders/outs when using just one sequence. At the bottom right is a strum bar that just outputs a high gate at the speed as you touch or strum back and forth. My intention there is to patch that out (#7 on the FH-1) to the X in on the FH-1. So you will be stepping and strumming through the sequence manually with this. There is a similar strum bar on the lower left to use for what ever going out output #8. There will be a page like this for sequencer A and B. Color is a bit off on this photo for some reason, but you get the idea. It looks brighter and cleaner in person. Tested the strumming and the FH-1 really responds to it nicely. You can strum gates at very high rates back and forth. It's a fun way to play a modular for sure... first time I've ever done it (before I have with the Mbrane 11 but today I strummed my modular for the first time and was at it for 40 minutes trying applications and techniques). We'll see video in time of that. And all of it. I also put together a general FH-1 Out Channel controller page. 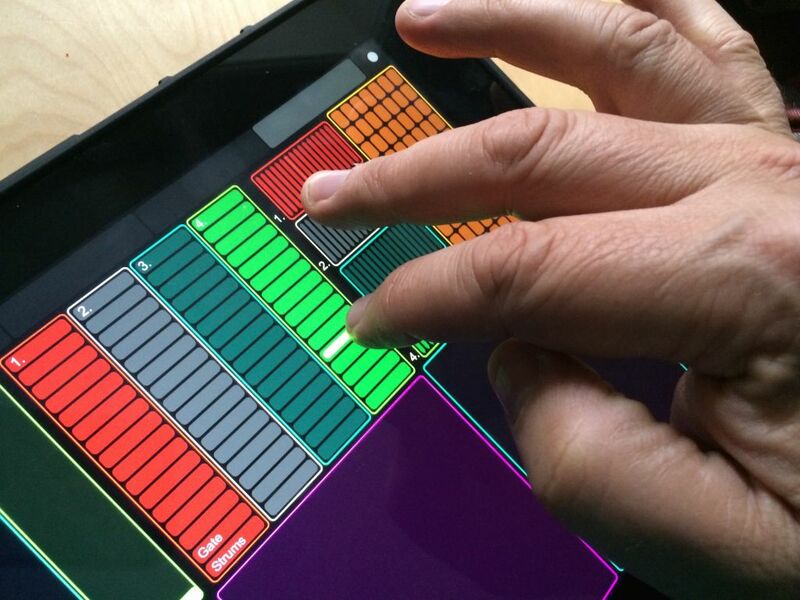 It gives several, finger sized sliders and strums and multi pads to access the 8 output channels. The real focus is on Outputs 1-4 and they are color coded to correspond to the 4MS channels (like on my 4MS Pingable Quad LFO.) In the top left and middle you can two hand control those four channels in mixes and picks back and forth using a smooth slide or gate strum. There is also to the right an even smaller strum array for 1-4 that lends it's self to VERY fast strumming. I've tested it with the 4MS PQLFO and it's a really cool way to ping and reset those Pingable LFO's. Super fun and a new thing for me to wrap my head around. It also was a blast triggering and controlling Maths hitting an oscillator. The 14 bit resolution with portamento actually sounds pretty dang smooth on the FH-1 outs, but these approaches really allow the FH-1 to shoot off and stutter voltage controlled analog functions right there in the modular. Just plugging the iPad right in... no computer. Left of that is an arbitrary level/output grid you can just drag a finger around. Each little cell there will fire off various, randomly set up levels out randomly placed FH Outputs. So the idea will be to circle a finger around there or tap around it to get some unpredictable results of a patch. It just sends basic levels out of a given output. Lower left are sliders for FH-1 Outs 5-8. Good finger size and length. 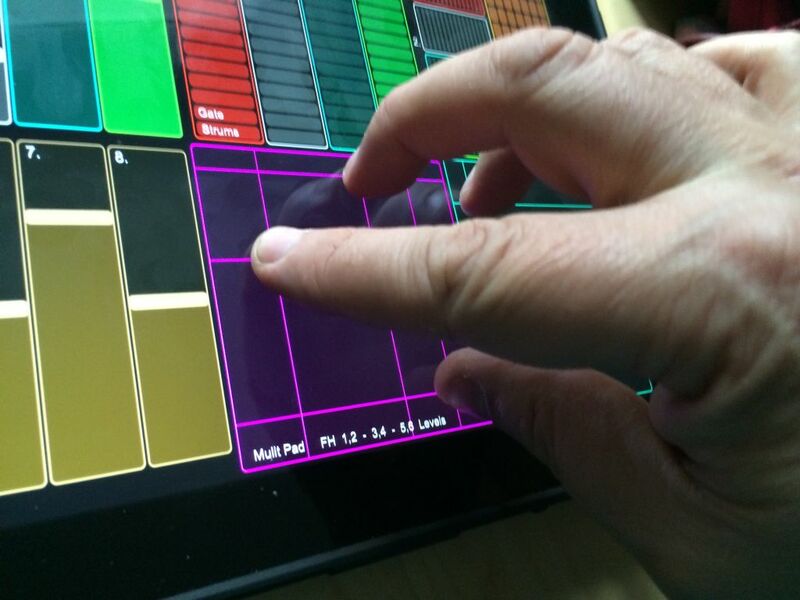 Then a multi touch pad lower middle... up to 3 fingers can track on it, each having an X/Y output for each a given pair of outs. I'll mainly use it with just one, maybe two fingers, but functionality is there for a ridiculous 3 finger/6 output modulation. I'll probably make a full screen version of that on another page... or two of them on one page with 2 pairs. 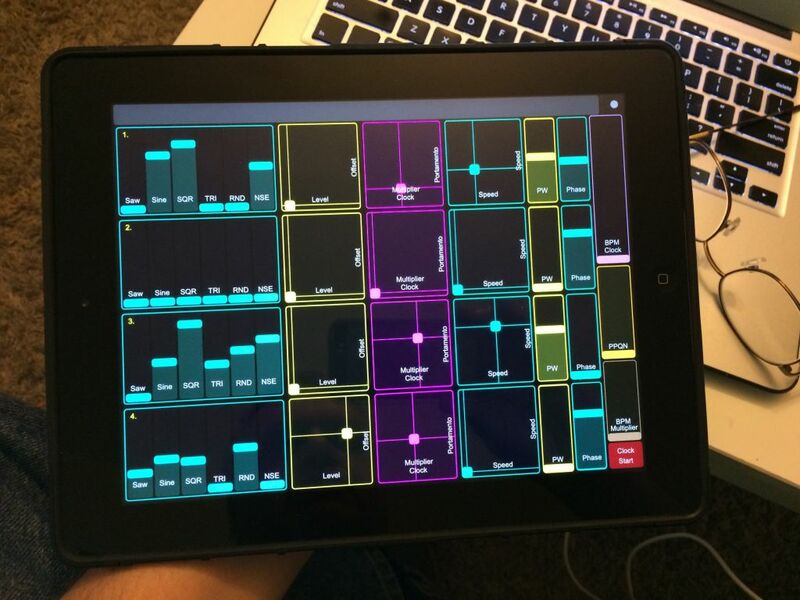 Bottom right is a more simple multi pad to control LFO 5, if active, just to add some more flavor to this page. The page just gives you a lot of choices for anything from minimalism and slow control to overloaded, ridiculous control to make everyone's eyes roll and heads shake. The gate strums and grid here also tested really well. They take forever to set up though... each little cell must be manually set on approach. But worth it. But that work will all be done... a user doesn't need to set those. I'm really trying to take advantage of OS's incredible design allowing these 8 channels to suddenly become something different just with a touch/midi change. This app also lets you very quickly go back and forth through these pages with a touch to mix up how these are all being used. I still have most of it to program midi channels and CC's on but so far so good. I still need to add a place to quickly adjust portamento for all 8 outs. I may do another strum page that strums many different outputs for pitch/filter level etc. for interesting playing. They just take a while to program each strum cell. Again, I want to say to OS that the FH-1 is just a brilliant creation. I got a similar control working quite effectively on a TouchOSC editor I made for the Jomox Mbrane11. Do you have a template for controlling MBase11 too? Are these templates something that you share for other people to use? I'm happy to share these for no charge. I wish I had one for MBase11. I just never have owned one. It would't be that hard to adapts the MBrain11's editor to the MBase11. It may even do a lot for it as is. If you want to give it a go PM me your email address and I'll send it to you. Here's a vid of the editor for the Mbrane11. It actually shows how cool the strumming thing can be so applicable here. Adding a separate fader for each LFO... so there will be 1 to fade in positive saw and one for negative. As I have it now, you have to carefully center the saw to have it not be present. That will be cool for some thing, like in the x/y pad approach, but not the main shape mixer for the LFO's. I'm also giving portamento it's own fader instead of in an X/Y pad. Testing has shown that's needed. Coolest thing I'm finding making this... is just how well the sequencers respond to high speed triggering... well into the audio rate, allowing for a sequencer to put out a really great sounding digital oscillator that lets you get deep into it's guts. If I send the sequencer even just to pitch of a nice sine wave, for instance, and trigger X input with a Pittsburgh or similar oscillator I can sweep a pattern nicely all the way into it becoming a really crisp, texturey digital oscillator. It sounds amazing. That'll be in on video with my testing. That'll be in on video with my testing. You're blowing my mind. I just picked up the FH-1 and just wanted to control some LFOs from some knobs. Now I have to rethink all that. Since May this year, haven't had time to work on this until just the last 2 weeks. Now it's done. Here are photos from today. Shot a new demo video last night and I'll post it soon. The video shows this controller driving CV lighting with modular patches simultaneously. All the slew/smoothness is what is given/dialed in by the FH-1... which is quite nice and juicy. 2 pages cover all 8 outputs for full LFO parameters. 1 page covers sequencer A and gates for out 8. 1 page with some big faders per channel, general triggering, multi touch pads, trigger strums and an endearing, ugly look to contrast it's direct usefulness. This TouchOSC/iPad template will be available free in a few days, PM me your email address and I'll send. Feel free to change/enhance. One may wish to copy the sequencer page and map for sequencer B. I just needed A and bunches of LFO's. There is a random grid of voltage triggers I didn't have time to finish, but there are lots of apps that do pretty much the same. So it's just there marked "unassigned". Much praise to Andrew (OS) for all his amazing instruments, including the incredible FH-1. 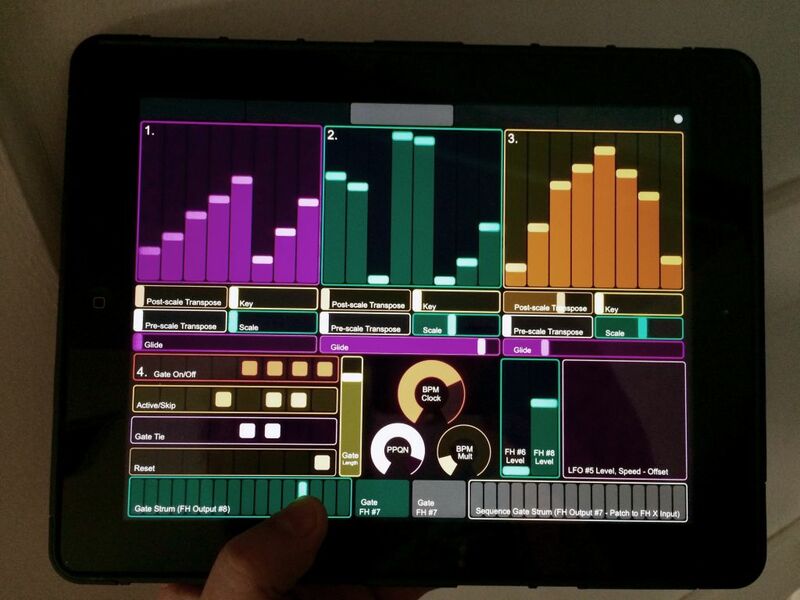 Next I want to make control surfaces for Silent Way in TouchOSC and Lemur for iPad. It'll be a while.